In fitting a hardtop to the already successful Explorer 595, Cruise Craft has a boat with the same characteristics as the original Cruise Craft Explorer 595 but with the protection and security of a solid roof. The Cruise Craft Explorer 595 is easily my favourite boat in the Cruise Craft line-up of fibreglass fishing boats. So how can you improve on a boat that already has a winning formula? If anything one would think a truckload more of fancy accessories might do it. 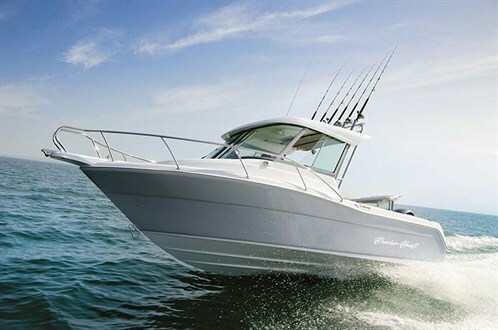 However, considering the trend towards and popularity of hardtops, as well as the success of the Cruise Craft 685 Hardtop and 625 Hardtop boats, the company has upped the ante and produced a hardtop version of the Explorer 595. Despite the fact that hardtop mouldings for the other models already existed, it has not just been a simple process of chucking one of those over onto the Explorer 595 – in fact it’s a whole new mould development trying to get it right, and that’s not forgetting all the stainless steel work, the glass and screens and overall structural integrity. The addition of the new hardtop to the Cruise Craft Explorer 595 most certainly takes the boat to another level. When it comes to aesthetics the hardtop adds style to the overall look, creates a clearer and more open visibility through the screens and windows, as well as adding good protection from the elements. 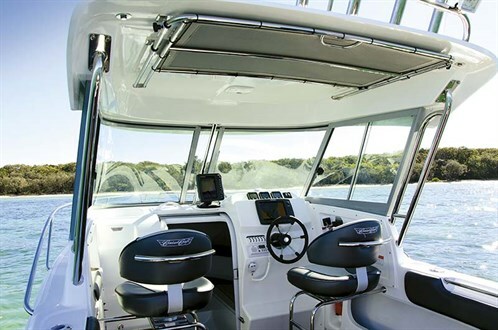 A slight tint on the glass reduces glare off the water, the split screen and stainless steel supports add to rigidity and strength, the rocket-launchers hold a good few rods, and the extendable rear bimini is a great option to have for the extra sun protection on the rear deck. Besides the trendy cosmetic features the hardtop’s added protection will really make the difference in areas where foul or colder weather is regularly encountered (hi to all in Victoria…). In the tropics it might be a bit of overkill but it shouldn’t be an issue to add an extra top hatch for added ventilation if need be. Although Trade-a-Boat previously reviewed the Cruise Craft Explorer 595 when it won Australia’s Greatest Boats 2013, I did not have the pleasure of conducting that first full review on the boat when it was first developed. Nonetheless, the time spent onboard scrutinising every last inch of the Explorer 595 at AGB was enough for me to tap the big figures onto the scoresheet and rate it number one. 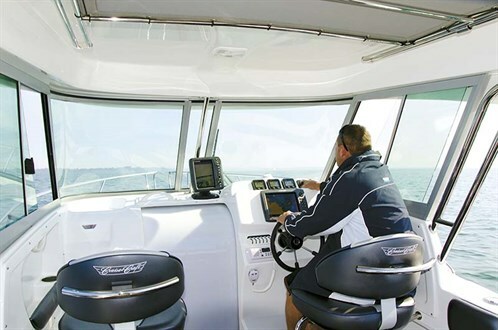 The Cruise Craft Explorer 595 Hardtop layout is just the same, with a clean and open plan filled with all the necessary fishing features to keep any fisherman happy. In particular I like the full bolsters around the gunwales, the large sidepockets with internal rod racks, the compact stern setup with livewell and baitboard, recessed full-length grabrails and the clip-in carpet option. Up front, the cockpit and dash layout within the confines of the hardtop is another area that is well thought-out. Here are side-mounted seat frames that accommodate a decent-sized Esky below, comfortable seats with inbuilt rear grabhandle, dual footrests and great dash layout with a decent viewing angle to the electronics. Rather than having an open plan cabin the Cruise Craft Explorer 595 Hardtop has a lockable sliding door, which is handy to have as you can leave gear on the boat behind lock and key. The cabins are spacious, loaded with storage and like the rest of the boat, finished off nicely. Out of the cruisy range, the Cruise Craft Explorer 595 Hardtop ticks all the boxes for me when it comes to performance and handling. Previously we had reviewed the Explorer 595 with the new Yamaha F200 four-cylinder outboard motor which proved to be a fantastic match. The hardtop version was tested with the new Yamaha F175 – the same motor but detuned and a little bit cheaper. Just like the F200 the Yamaha F175 XA is another perfect match for the Explorer 595 Hardtop. These four-cylinder engines are most impressive, boast a zippy holeshot and decent a top-end of around 38kts. Economy is not bad either with a mere 4.92lt/h being chewed at a troll speed of 5kts, 21.95lt/h at cruise speeds around 20kts, while at WOT 63lt/h can be expected from the 175hp motor. In a fair chop off a 15kt wind and reverse tide you can comfortably sit back at the helm and relax at speeds of 20kts, without having to work the throttle. I like the stability on this boat in the ride and at rest, as well as the dryness of ride when quartering the chop. Although fitted with a windscreen wiper, there was no need to use it on this day as the spray was deflected nicely off the aggressive outer chines and strakes. You can achieve higher speeds, although it’s your own preference as to how you take on the chop and swell but for me, these boats work best at civilised and economical driving speeds. At 5.95m in length it’s really an easy boat to drive, launch and tow and when it comes to overall performance and handling, the 595HT feels at home and very safe on the water. 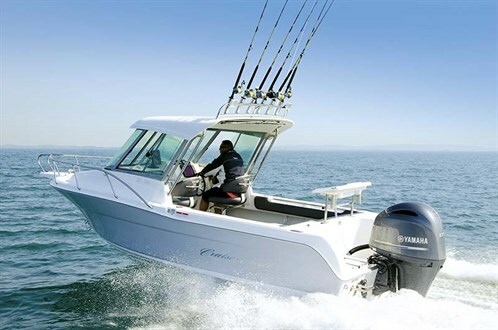 There’s no change in the overall fishing setup either – it’s the same as the standard Explorer 595 but with a bit more protection from the hardtop and extended bimini insert. Like any hardtop version the Cruise Craft Explorer 595 Hardtop does cost more but personally, I think it’s worth the extra spend, especially for those in cooler climates or those just wanting a more protection. 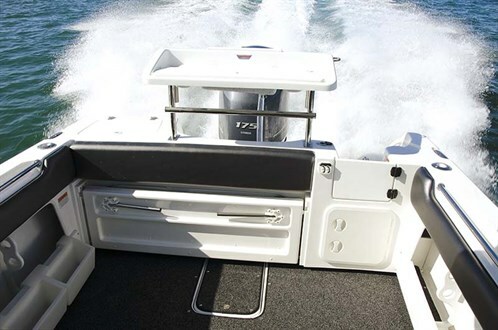 The change to the look and style, as well as it being a permanent fixture, not only makes the boat more appealing but in my opinion, also adds long-term value to the boat. Having a hardtop also eliminates the ongoing maintenance of replacing clears and material to standard biminis. Another big positive with the Cruise Craft Explorer 595 Hardtop is the weight of the package, coming in at some 2250kg and eliminating the need for a vehicle with a three-tonne towing capacity. 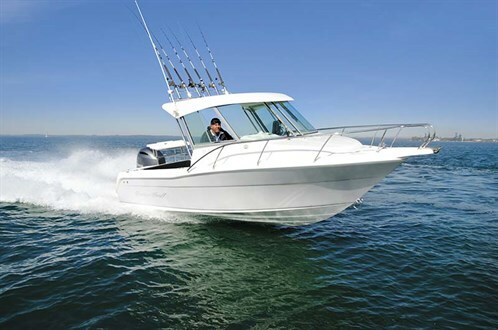 Overall the Explorer 595HT is yet another excellent Cruise Craft fibreglass boat suited to family boating and fishing. As well as being a nice performer she is well-presented and finished off nicely in all areas. Single 175hp Yamaha F175 XA outboard motor with 18in SDS Reliance propeller.